Life is Feudal • View topic - Development News #65 - CBT5 is Live! LIF:MMO is Moving Full Steam Ahead! As promised in our recent CBT#5 announcement, we would like to share more details about the upcoming events that we have planned. 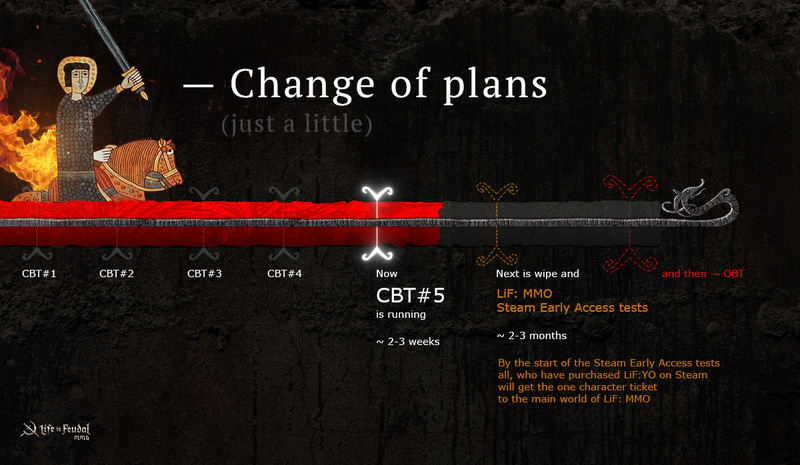 Currently, we’re in the beginning of the CBT#5 testing phase, which will last for a few weeks until we reach a level of acceptable stability, balance and overall quality of the game. After that, we plan to shut the servers down for a couple of days in order to wipe them, shuffle resources and make some map corrections and tweaks. Once these changes are complete, we plan to start a new phase of testing - Steam Early Access Tests! We will let those, who have purchased LiF:YO on Steam or have purchased Believer Packs to get into the game so they can redeem their tickets to transfer one of their characters on the main continent - Abella. We want also to highlight, that we have NO WIPES planned during or after the Steam Early Access testing phase. During Steam EA tests we will provide our supporters, who have bought Believer Packages, with all the benefits that were promised and are listed here. Ingame shop monetization will also be implemented and enabled, so you’ll be able to check out some cool new skins for your armor, weapons and apparel. After 2-3 months of Steam EA tests, we plan to reach an OBT and open the game for everyone to experience! Anyone with a Steam account will be able to download and experience Life is Feudal:MMO for free in our new starter island areas. P.S. We almost forgot, our NA players can expect their regional server to appear and become available 2 weeks from now. We will need your help to test these servers to make sure that everything is running properly on the new hardware in this region. This will help us to ensure a smooth launch of the NA region server along with the EU region during Steam EA tests. P.P.S. Don’t forget to check out Brightlocker where you can earn exclusive Life is Feudal perks and rewards. Re: Development News #65 - CBT5 is Live! LIF:MMO is Moving Full Steam Ahead! Last edited by Khan- on 18 Aug 2017, 17:22, edited 1 time in total. Outstanding. Thank ya'll for being a company that follows through with early access/alpha development into a real finished product. so we get 2 whipes 1st after this cbt5 and 2nd one after the last cbt before obt ? Good job on the fast progress! I love you, are you free for dinner tonight? Sebastian002 wrote: so we get 2 whipes 1st after this cbt5 and 2nd one after the last cbt before obt ? what about the south pacific / Australasian Region you promised us? Shuffling and wipe information are what to expect. I am going to have to wait after CBT5 to get to have "fun" without fear of character wipe. P.S. If you add horse pulling cart or trader cart, I am sure lot of people will be happy. will you be able to switch from eu to na servers? does the wipe includes characters as well? hope not! Goodwillhunter wrote: great news! thank you Guys! It does. It wouldn't be very fair for the new players if it didn't. Arrakis wrote: It does. It wouldn't be very fair for the new players if it didn't. That's fine and all, but then shouldn't we not spend our... tickets? If the characters get wiped, does that mean we won't have a character that can leave the starter area? If we bought YO or one of the packs we WILL get to play the full game and have a character on the main continent after the beta right? When early access starts you will have all available tickets that you purchased for character slots to bring to the mainland, yes.